Pre-planning a journey to another country can be tricky, especially taking into consideration all the research that needs to be done prior to the trip as well as the endless number of trains, connections and coach classes to select from. To make the process as fast and stress-free as possible for you, we did our best to make searching, choosing and booking Russian train tickets on our website easy. 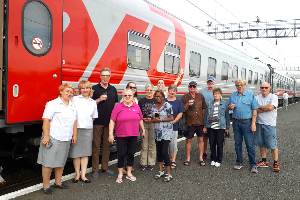 If you’re planning to travel to Russia, the Baltics or Eastern Europe, here you can book Russian train tickets for any trains, such as overnight trains, high-speed Sapsan trains, or luxury trains from Moscow to St. Petersburg. More than 150k travelers used our train ticket service and can affirm that it is reliable and convenient. Excellent service! I am impressed with the ease of buying a train ticket. Moreover, I emailed with questions, which were answered immediately. Congratulations on the service.